Thank you to all of the participants and supporters of the 4th Workshop in Behavioral and Experimental Health Economics in Cologne. Following the great success of the previous workshops in Oslo, Hamilton, and Essen, we got a large amount of submissions and gladly recognized growing interest in the field. 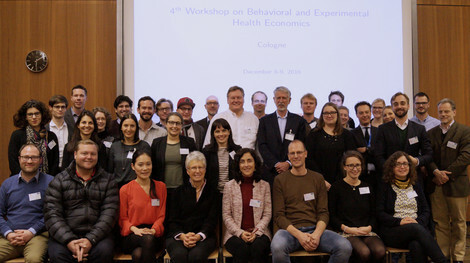 The workshop created a platform for researchers at the interface of health care and behavioral economics and at the same time fostered the exchange with national and European health care policy makers. In this year's workshop, we introduced a short presentation session where participants were given the chance to present their work in a 5-minute "speed dating"-manner followed by a poster presentation and reception. We concluded the workshop with a panel discussion on the topic "Surveys Versus Incentivized Experiments?" with Jim Cox, Matteo Galizzi, Glenn Harrison, and Peter Zweifel. For further impressions of the workshop please see our Gallery! Some opinions on the workshop can be found in this video! There are already plans being made to hold a 5th workshop at Georgia State University in December 2017.